Jay asked us, "What did you want to be when you grew up?" I can't remember it. Probably, I didn't have any plan. Consequently, I couldn't have dreams. So, I sometimes ask my youngerson about thing. He said "I want to be train driver." My older son was same too. Also my husband was same too in his chaldhood. 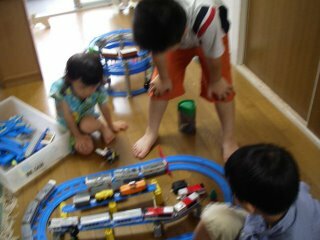 Boys like trains in Japan. They like to see trains or books about trains. Next month, we are going to the Hokkaido region. And we will get on trains and steam engine. My sons will enjoy trains. 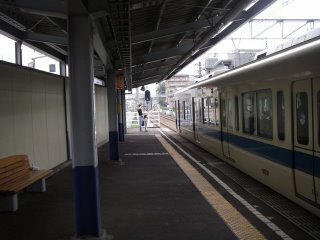 By the way, what would you say in English "a driver of train"? I think it is not a train conductor. 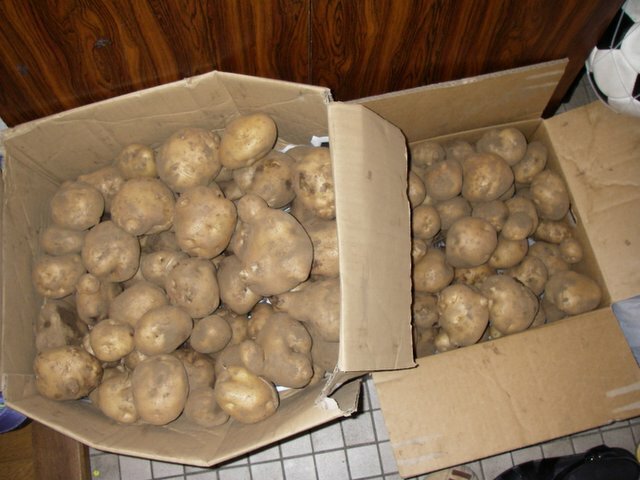 Kids were carrying "kunchi " around thire pre-shool and they were calling " WASHOI ! WASHOI !" What is "kunchi" ? I'm not sure. 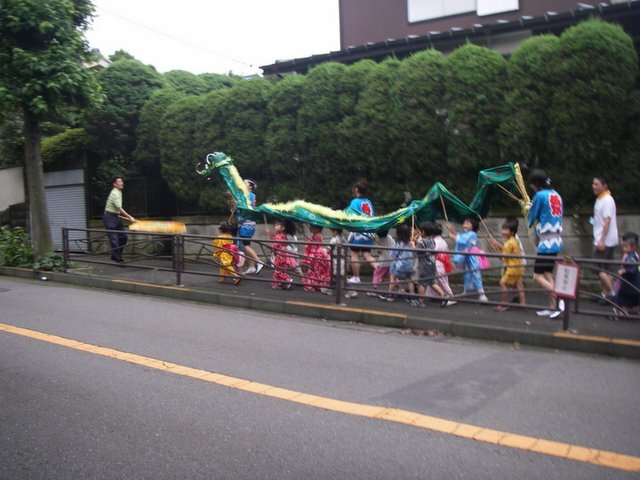 In some Japanese regions, they carry "kunchi" in their festivals. Probably, "kunchi" ｗａｓ born in Chaina. 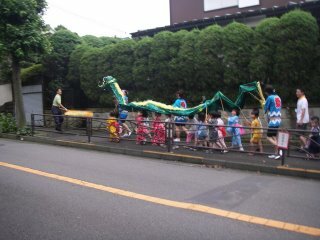 We enjoyed dancing in my younger son's summer festival in his pre-school. He is good at dancing. He knows a lot of dances. 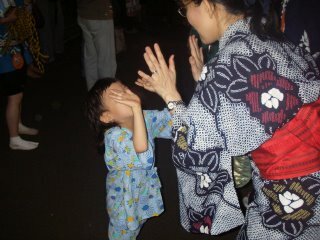 I hope he will become a nice, special, Japanese dancer. Today is my birthday. It is secret thing. Before I posted " I am not young..."
Lanternlight said "Oh tosh! I bet I'm older than you. And I have the grey hairs to prove it. :-) "
Noway, I have the grey hairs too!!! I am older than you. And I forgot my ages. When I watched a film called "Cocoon", my mother said " I want to go with them." But I didn't think so. Now, I understand her feeling more. When I was very young, I watched an American TV Show called "Bewitched". I have forgoten the stories. But I just remember I have one question. "Why do they take their shoes off ?. " "They are walking around their room with their shoes on. " I asked my mother "Why?" When I was young, I lived in old, wooden, Japanese style house which was not small. And there were a lot of fields around our house. Therefore my shoes were dirty every day.
" I think so too, why? It must be hard to clean their rooms." "I'm sure American roads are paved. I heard cleaner machines work on the rodes." When I was young, we didn't see foreigners in our town. Foreigners were justTV. Actually, I remembered this story, when I watched Cazzie's slipper. When my mother was healthy, she went to foreingn coutries. Probably I think she could find her answer. Now she is sick. I am so sorry that I can't ask about it. Yesterday, it was a holiday. But it was rainy day. Downstair neighbor came over to our home. Three boys played in our home. I thought our room might break. But they enjoyed. Downstair's boy can speak English very well. (His mother is American.) He taught me something in English. When his mother picked up him, she brought two her daughters to our home. Five kids!! My older son is 9 years, her oldest son is 8 years, my younger son is 4 years, her older daughter is 2 years, and her younger daughter is 1 year. Anyway, our downstair's neightbor came over to our home, therefore they could step on foor. 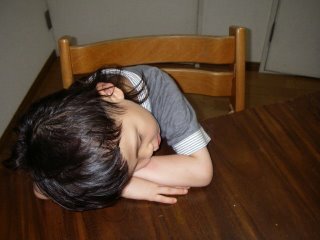 My younger son dozes off after our dinner on weekends. Because he doesn't have time to nap. So, after dinner, he is sleepy. Sometimes he eat dozing. He does things his way. Kieran was really sad about results. SaWa too. Each people of country wanted to win their teams. Of course I wanted to post about Japanese team like Wendy A, when Japanese team wined. I watched "The Zidane headbutt" on Jay's blog. My sons watched it again and again. I didn't know what was "headbutt". I found that was certainly "headbutt". By the way, I am intersted in their language on their conversation. Zidane is French. They fighted in English or the other? They are global players. therefore they could understand it in non their mother's language. Anyway it is difficult to fight for Japanese player in the other language except some Japanese player. 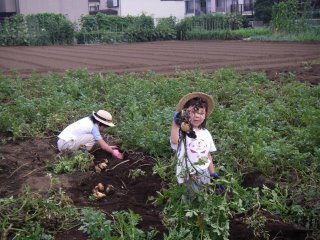 My friend has potato fields in Tokorozawa which is in Saitama prefecture. We visited her husband's field. 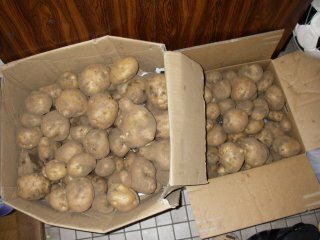 And we digged a lot of potatos. So we enjoyed it. In Japan, farming is difficult to get enough money. He is a farmer with a side job. 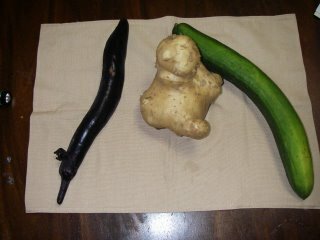 My friend gave us some big vegetables. Big cucumbers bring my father's memory with me. (Big cucunber remind me of my father.) My father raised cucumbers which were big. When he was healthy, he gave us big cucumbers. I thought I didn't like them, but now I miss them. Today is The Star Festival. Unfortunately, it won't be nice day tonight. We can't see The Milky Way from Tokyo. Anyway, it is too bright to find stars in Tokyo. Can you see stars in your town? 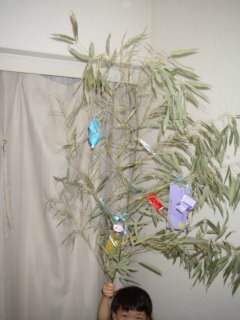 We write wishes on Tanzaku which is small pieces of paper. And we hang up Tanzaku on bamboo. My older son wrote wishes instead of my younger son. *I want to be able to run fast. 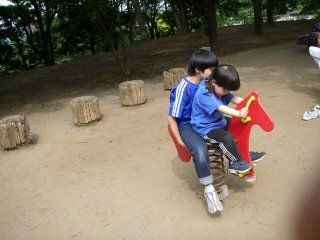 I wrote about my younger son in March. That was my younger son's poo story. We went to a department store again last friday. When my younger son wanted to go to a bathroom, they looked toys by themselves. My older son brought my younger son to a bathroom . So my older son wiped my younger son's poo. As I heard this story, I respected my older son more. My younger son is not frightened of animals. 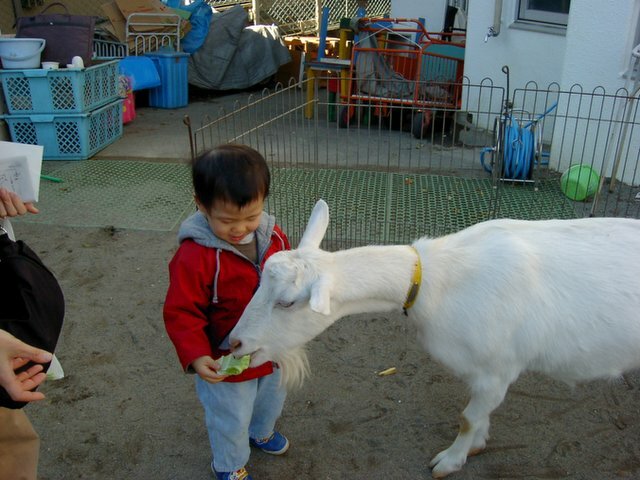 When he was 1 year old, his pre-school teache said that he had tried to pick goat's nose. 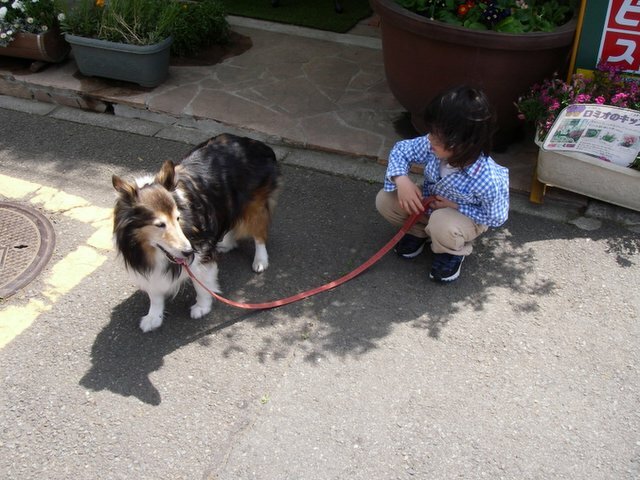 He likes Juri, who is his grandmother's dog. Then he was got angry at niese's dog. While his hand got a bite, he was crying. But my niese dog is very kind dog. He was safty. Anyway he is very active boy.